PROVIDENCE, R.I. - The No. 8 Providence College women's hockey team captured the 24th Mayor's Cup with a 8-0 win at Brown on Tuesday, Dec. 5 at Meehan Auditorium. Meehan Auditorium | Providence, R.I.
- The Friars, who had been unable to get on the scoreboard in the first period of the last four games, opened the game with two goals in the first 20 minutes. - Near the midpoint, Emily Landry (Orangville, Ontario) forced a turnover at the offensive blue line. She skated down the left side and ripped a shot over the blocker of Hayley Kliczko. Landry's goal, which was unassisted, was her second of the season. - Cassidy MacPherson (Oakville, Ontario) extended the lead to 2-0 at the 17:47 mark of the first. Sara Hjalmarsson (Bankeryd, Sweden) danced around the offensive zone and delivered a pass directly to MacPherson's tape for a back-door tap in. Giana Savastano (Mapleville, R.I.) picked up the secondary assist. - MacPherson's goal was her sixth of the season. Hjalmarsson's assist was her seventh, while Savastano's was her third. 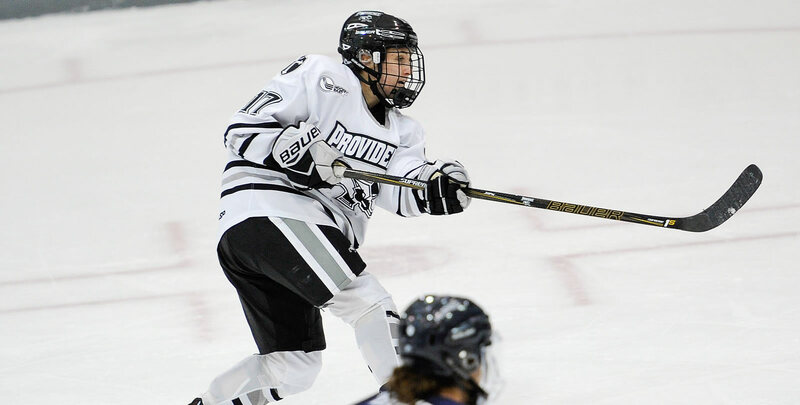 - Hayley Lunny (Bedford, N.Y.) continued the Friars' scoring by notching a goal 3:31 into the second. Annelise Rice (Excelsior, Minn.) and Neve Van Pelt (Mitchell, Ontario) assisted Lunny's fourth of the season. - Rice's assist was her second and Van Pelt's was her third of the season. - Kate Friesen (Altona, Manitoba) extended the lead to 4-0 with a 5-on-3 goal 7:39 into the second. Avery Fransoo (North Battleford, Saskatchewan) and Meaghan Rickard (Coventry, R.I.) assisted the goal, which came with one second remaining on the two-man advantage. - Friesen's goal was her third of the season. Fransoo's assist was her eighth and Rickard's was her fifth. - MacPherson notched her second of the day just 1:59 into the final period. Lunny and Ariane Julien (Saint-Hyacinthe, Quebec) assisted the goal. - Maureen Murphy (Buffalo, N.Y.) joined the scoring party at the 10:35 mark of the third. Christina Putigna (Grimsby, Ontario) and Rice assisted Murphy's 15th of the season. - Rice's two assists marked her first-career multi-point game. - Freshmen Ciara Barone (North Tonawanda, N.Y.) and Caroline Peterson (East Falmouth, Mass.) capped the game with goals to make it 8-0. Barone's was the second of her career, while Peterson's was her first. - 16 different players recorded at least a point. Rice, Murphy, MacPherson and Lunny each had two-point games. Seven different Friars scored goals in the game. - Madison Myers (Colchester, Vt.) finished with 12 saves. Clare Minnerath (Sartell, Minn.) who played the final 8:24 of the game, made three saves. Providence concludes play in 2018, hosting Holy Cross on Friday, Dec. 7. Puck drop is set for 6:00 p.m. at Schneider Arena.